The Last Supper is an event related to the texts of the News Testament; that reports the last set of instructions given by Christ to his disciples and apostles. It is during this ceremonial occasion that a new Covenant is established. 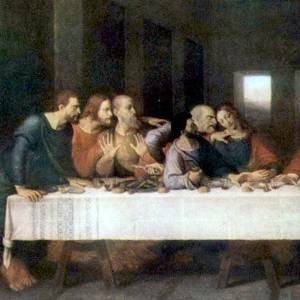 The Last Supper, as we know, is portrayed by Leonardo da Vince, and correctly describes the reaction given by each apostle when Jesus states that one of them would betray him. All twelve apostles have different reactions to the news, with various degrees of anger and shock. The painting contains several references to the number three, which represents the Christian belief in the Holy Trinity. The Apostles are seated in groupings of three; there are three windows behind Jesus, and the shape of Jesus’ figure resembles a triangle. There may have been other references that have since been lost as the painting deteriorated. 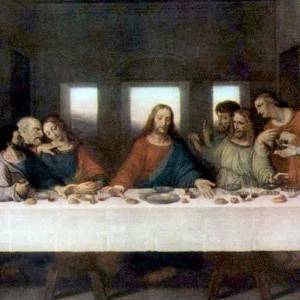 The Last Supper has also been the target of much speculation by writers and historical revisionists alike, usually centered around supposed purported hidden messages or hints found within the painting. 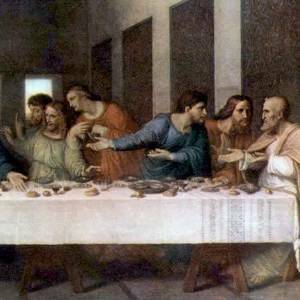 In his analysis, Da Vince’s Last Supper invites us to examine the disciples and their position, from the right to the left. On the head of the table is St. Simon, who represents the sign of Aries, the zodiac sign of fire and action. Simon’s hands indicate the direction to take. Aries astrologically governs the anatomy of the head, and Simon’s forehead is well highlighted in the painting. Its readiness is also shown by the creative Aryan* hands, to act according to the will and courage of the Aryans. On the left is St. Jude, representing Taurus. His countenance is angry while listening to Simon as if slowly digesting his impressions. His hands are in the posture of one who receives something, characterizing the possessiveness of Taurus, which is the sign that accumulates. In the human body, Taurus rules the neck and throat, and that of Jude is well highlighted. St. Matthew comes next, as the representative of Gemini, the Twins, the double sign which governs the interaction with people and ability to gather information. Matthew has the willing hands and face on opposite sides of each other, revealing the Gemini habit of talking and listening at the same time. Matthew was a scribe and the historian of the life of Jesus: he wrote one of four books accepted as genuine by the Catholic Church. Gemini rules the 3rdHouse of the Zodiac, the House of communication and knowledge. To the left is St. Philip, representing the sign of Cancer. His hands are towards the chest showing the Cancerian tendency to accommodate, protect and take care of things. Ruled by the Moon, Cancer works with feelings. Philip is angled forward, portrayed as if offering himself to perform some task. At his side is St. James the Lesser, the Leonine, arms open, revealing with a sweeping gesture the power to radiate love. Leo governs the heart and the heart chakra. The expansive gesture shows his confident nature and the centering attention. Behind him, almost hidden, it is St. Thomas, representing Virgo, the famous “seeing is believing” disciple. Thomas does not fail to express the critical and inquisitive side of Virgo: with raised a finger he disputes before Christ. To the left of Jesus, Libra is symbolized by Mary Magdalene, Jesus’ supposed wife. With hands clasped, she weighs and considers all opinions before taking positions. Libra rules the 7th House, which is the sector of marriage and partnerships. There is conjecture that this figure was left as evidence that the Templars supposedly had knowledge about the marriage of Jesus and the destination of his descendants. Others state that this is not Mary Magdalene, but Saint John, the apostle, referred to as the one which Jesus loved. Beside him is Judas Iscariot, Jesus’ bodyguard, representing Scorpio. With one hand he holds a bag of money and with the other hand he knocks on the table in protest. Scorpio rules the 8th House, which deals with goods, death, money, debts and the property ..of others. Next is Peter, the Fisherman of Souls, representing the joyful Sagittarius. It was he who created the original dogma and church law. Sagittarius rules the 9th House: industry, law, religions and philosophy. His finger points to Jesus as the goal of Sagittarius is spiritual. He also stands between Mary and Judas, bringing clarification and light to the discussion. Sagittarius is the “uplifting” sign of the zodiac. At his side is St. Andrew, the Capricorn. The most responsible sign of the zodiac, he imposes limits with his restrictive gestures. His thin face and protuberant bones reveal the Capricorn biotype. His hair and beard are white, and his face shows the serious relationship that Capricorn obtains with time and wisdom. Beside St Andrew, we find St. James Major, the Aquarian, who addresses the other apostle with one of his hands on the shoulder of James in a friendly gesture, while the other extends to the yet another. He sees all, encompassing the discipleship led by Jesus. Aquarius rules the 11th House, which encompasses the industry groups, friends, social communications and hope. Finally, sitting on the left, we have St. Bartholomew, the traveler, representing Pisces. His feet, which are governed by Pisces astrological anatomy, are in focus. He seems absorbed by what happens at the table and, leaning on his hands, makes a devotional statement that reveals the climate of this meeting. intriguing huh….astrology and last supper!! wow! I never looked at the last supper through this angle. very interesting astrological analysis of the painting.